This mini tuocha is composed of good quality raw Pu-erh leaves, blending in proper amount of sticky rice leaves, a edible plant in Yunnan, through special technology. The tea is characterized by its sticky rice fragrance, with plenty of flavor to give up when brewed. One tuo weighs approximately 5 grams, individually wrapped single serving tea balls, each tuo makes one cup (plus repeat infusions). PREPARATION: To prepare Mini Tuocha, place one in a teapot. Rinse by covering with boiling water and quickly pour off. Cover with boiling water again and let steep 5-30 seconds (depending on how light or dark you want the tea) and serve. After the first infusion the tea has just gotten started so keep on infusing. 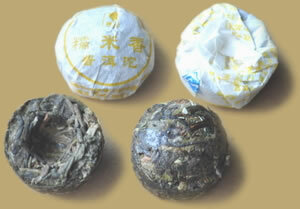 Mini Sticky Rice Fragrance Tuocha can be steeped 3-5 times.